SightPlan is excited to announce the addition of Justin Jasper to our rapidly growing team. Justin joins us in the role of Senior Vice President of Sales with a focus on initiating customer relationships and growth. Based in Dallas, Texas, Justin joins SightPlan with 13+ years of experience in software sales, with 9 of those years selling software directly in the multifamily industry. Justin has been named a 5-time top producer and many who have worked with him have raved about his skills in strategic selling and developing deep customer relationships. Before he began his career in multifamily, Justin worked for prestigious technology companies including Dell and SolarWinds, where he excelled in sales and account management roles for both small and enterprise accounts. Justin’s experience in software sales led him to the multifamily industry where he recognized the role technology could play in helping multifamily organizations. His experience started with RealPage and he has since worked with other organizations in the industry including Appfolio in senior sales positions. Prior to joining SightPlan, Justin served as Director of Sales for The Rainmaker Group, where he was named the Top Revenue Producer for 2016 and 2017. Additionally, Justin has been awarded multiple times for his new client acquisition and has received the President’s Club Award. 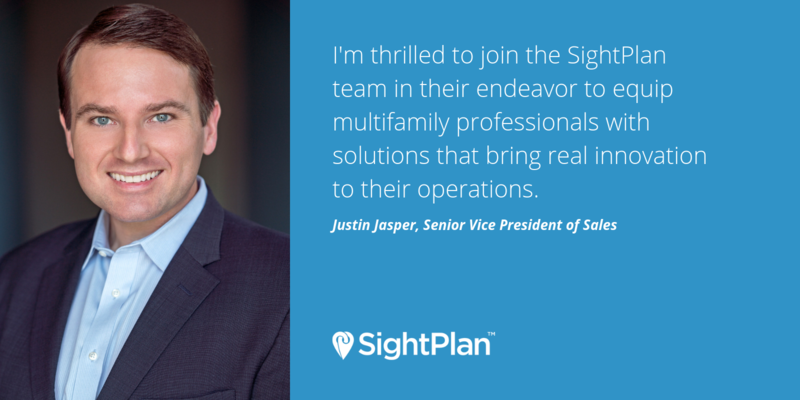 “I am thrilled to join the SightPlan team in their endeavor to equip multifamily professionals with solutions that bring real innovation to their operations,” says Justin. As a leading facilitator of growth for many multifamily organizations, Justin is excited to work with SightPlan and support our mission to supply management teams with the tools to provide exceptional service. As SightPlan expands, we are continuing to search for dedicated and hard-working individuals to join our team. Keep up to date with career opportunities and openings by visiting our career page and following our social channels.